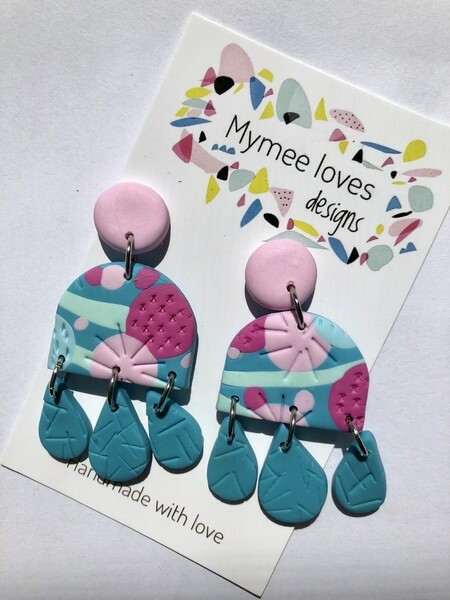 Gorgeous handmade mixed colour of teal, mint, pink polymer clay drop earrings made in Geelong, Victoria. Measuring approx 50mm drop and 22mm mm width at its widest point. All my earrings have hypo allergenic stainless steel rods and backs. There may be minor colour variations due to differences in screen monitors. Please be assured that every attempt has been made to represent our products and colours as accurately as possible. Please don’t wear in water and be careful not to drop them as they are very delicate. Each earring is designed, and crafted by me. Every earring has been carefully shaped and designed making each pair unique. Please note there may be slight imperfections in the clay as this is something that naturally occurs when working with this medium. This is the beauty of handmade. I can do custom designs and colours also. Please pay within 2 days of purchase.